Whether you’re celebrating a birthday or spoiling someone special, it’s hard to beat the old-world charm of traditional afternoon tea. If your budget won’t stretch to the timeless elegance of Claridge’s or The Dorchester, don’t worry – we’ve rounded up some of London’s best value teas so you can dine in style without breaking the bank. The Delaunay, Covent Garden – This grand brasserie serves a Viennese-inspired afternoon tea at just £19.75 per person, plus a cream tea for £9.50. After the traditional sandwiches and savouries, guests can look forward to Austrian specialties like Sachertorte, Stroh rum cake, and poppy seed Gugelhupfs with cream and apricot jam. Ham Yard Bar & Restaurant – Escape the crowds of nearby Piccadilly Circus and refuel at this modern Soho hotel. 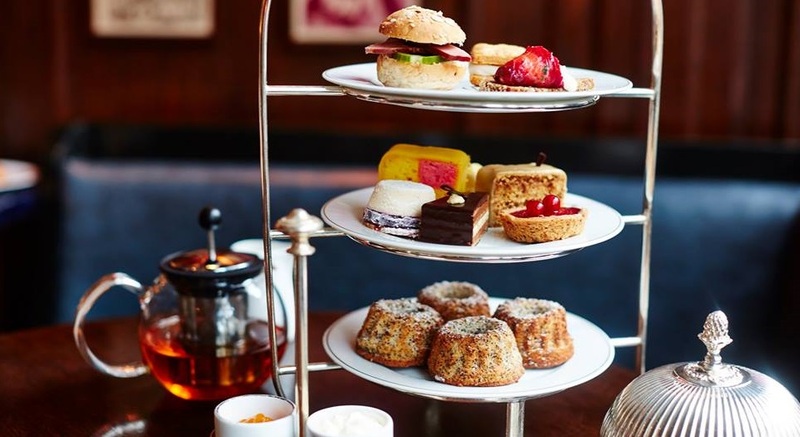 At £21 per person, their afternoon tea is a surprisingly affordable West End treat. There are specialty teas and infusions to choose from and the chefs can also create sugar-free, gluten-free and vegan afternoon teas on request. Roast, London Bridge – Enjoy afternoon tea for £20 per head at this iconic British restaurant overlooking busy Borough Market. Save room for a slice of their carrot, ginger and walnut cake with cream cheese icing. The German Gymnasium, King’s Cross – Enjoy bite-sized sweet and savoury treats washed down with a pot of tea for £18.50 in The German Gymnasium’s Grand Café. There are German and Austrian versions to choose from and if you’re in a celebratory mood, why not add a glass of Schloss Vaux Sekt sparkling wine for £4.50? Villandry – At Villandry’s all-day restaurants in Great Portland Street and St James’s, you can indulge in traditional afternoon tea for £19.50. They even throw in a glass of Champagne on the weekends! Rabot 1745, London Bridge – At Rabot 1745 in Borough Market, they use freshly roasted cocoa as a subtle savoury spice in their dishes and drinks. Their quirky, cocoa-infused afternoon tea is priced at £25 per person and you can add a glass of fizz for £5. Expect deliciously unusual treats like chocolate and orange scones, rare beef sandwiches with white chocolate horseradish, and chocolates made by their on-site chocolatier. Gallery Mess, Chelsea – At the light and airy café at the Saatchi Gallery, you can enjoy tea in the sunshine on their alfresco terrace. Afternoon tea starts at £17.50, or £9.50 if you just fancy tea and scones. Dean Street Townhouse, Soho – The all-day dining room at this stylish hotel serves tea between 3 and 6pm. Their tea menu is short and sweet but there’s something to suit everyone, from fresh mint to Lapsang Souchong. Their full Townhouse Tea will set you back £19.50, but you can order sandwiches, scones and cakes separately for a wallet-friendly deconstructed version. For more teas under £25, check out Le Chandelier, Skylon, Chiswell Street Dining Rooms, and the Great Court Restaurant at the British Museum. You can also browse our list of top London tearooms for some of the more decadent options.